With fewer new nurses entering the profession, the average age of the RN is climbing. According to the 2004 National Sample Survey of Registered Nurses released in February 2007 by the federal Division of Nursing, the average age of the RN population in March 2004 was 46.8 years of age, up from 45.2 in 2000. That means that menopausal women dominate the nursing profession. Remember, we're grumpy, so you should always be nice to your nurse. I love Dr. Seuss. Here’s an email that I received from my mother. Enjoy! Ah, this really rings a bell with me! The most unfair thing about life is the way it ends. I mean, life is tough. It takes up a lot of your time. What do you get at the end of it? A Death! What's that, a bonus? Oh dear! I am well past the average age but still too young to retire. 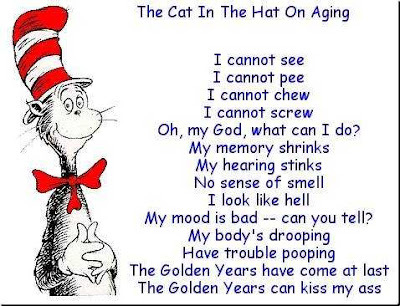 Oh, and menopausal women scare the c**p out of me but the Dr Seuss cartoon says it all. The Dr. Seuss cartoon is way too funny. And I second George Carlin's idea.